All transactions are safe and secure with a reliable history in online purchasing behind each of our associates. 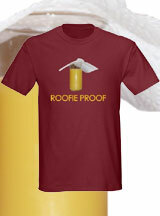 Buy the Hangover 2 Roofie Proof t-shirt to own Hangover 2 clothing and merchandise. Vegas may have seemed like a trip Stu, Phil, Alan and Doug would want to remember, but apparently it really scarred Stu. "Do you see that? That's orange juice with a napkin on top so nobody roofies me." That's right. He has taken to roofie proofing his drinks even at the local IHOP with his friends. He is completely satisfied with his breakfast being his bachelor party. His plan goes well until the unexpected happens. He was prepared for his drinks to be spiked but not his marshmallows. Expect the unexpected in this Hangover quote t-shirt. In addition to the Hangover 2 Roofie Proof tee above, browse the Hangover 2 Clothing Gallery for more apparel like men's and women's clothes, kids shirts or hoodies.